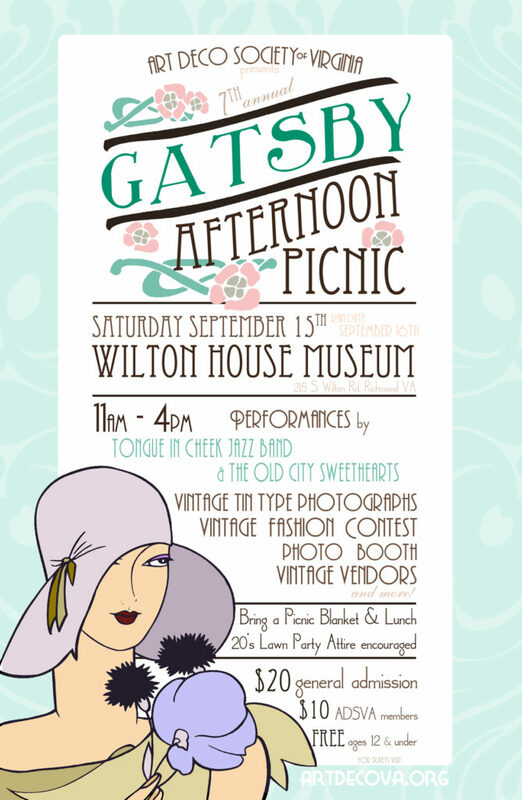 Grab your boater, your garden party finest and your picnic basket and join the Art Deco Society of Virginia as we journey back in time to the 1920s, where afternoons on the lawn consisted of friends, food and frivolity!The 4th Annual Gatsby Afternoon Picnic will take place on the lush lawns of the Wilton House Museum. Enjoy a leisurely afternoon dining with friends, both new and old, while overlooking the beautiful James River. Want to beat the crowd and pick out the best picnic location? Or be the first in line for a paper moon photo? With the Early Entry Pass, you can gain access to the grounds at 10:30 a.m. Kick up your heels to live 1920s swinging jazz by Baltimore’s own Tongue in Cheek Jazz Band! We also are pleased to welcome Philadelphia’s premier vintage chorus girl troupe, The Old City Sweethearts! Please enjoy some photos from last year’s event by Lynn Redmile.